Post April 2006, clients may be entitled to Pension Commencement Lump Sum (PCLS) of 25% of their fund value – subject to a maximum fund of their Standard Lifetime allowance. However at A Day (6th April 2006), for certain clients they may have had a PCLS entitlement of more than 25% of their fund, or have Primary or Enhanced protection. They may also be considering Fixed Protection. An additional lump sum which relates to any increase in the value of the individual’s benefits that has occurred from 6 April 2006 onwards. 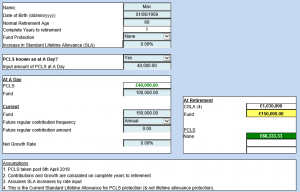 Depending upon client’s situation, the Pension Commencement Lump Sum calculator will provide an indication of the client’s projected PCLS entitlement at retirement. The PCLS calculator also has a separate (DB) page that will calculate the maximum PCLS that can be payable under a Defined Benefit scheme. Once details of the DB pension and Commutation Factor is input, it will show the maximum PCLS and corresponding amount of reduced pension.